I was fortunate to have been given a strong grounding in 5-paragraph essay writing in high school. One of my old teachers is still around, and I never fail to thank Mike Stokes when I see him at a reunion or a function at the school. 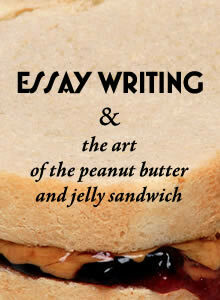 Years later, when I taught thesis writing, I’d have my graduate students start with a simple exercise: Write the topic paragraph for an essay called “The Art of the Peanut Butter and Jelly Sandwich.” If you want to test yourself, take 5 minutes to try the exercise before reading on. Start with a point you want to prove or a topic you want to explain. That’s your title. The opening paragraph contains one or more sentences that explain what you’ll talk about. Without giving details, tell the reader how you will support your point. The humble peanut butter and jelly sandwich is a traditional American lunch. Though it’s usually assembled with mediocre ingredients, a truly exceptional PBJ is made with three important components: artisan bread, natural peanut butter, and gourmet jelly. Learn the art of the peanut butter and jelly sandwich to take lunch to a new level. Common white sandwich bread is stacked on grocery store shelves, but it can’t compare to a loaf of fresh artisan bread, still warm from the baker’s oven. Consider two thick slices of wheat bread or sourdough. Raisin or nut bread adds texture and taste that can’t be found in a store-bought loaf. The very name “white bread” has become a common metaphor for anything bland, boring, and colorless. Start your peanut butter and jelly sandwich with two slices of excellence. Peanut butters are not all created the same. Store brands usually add unhealthy hydrogenated oils that keep the natural peanut oil from separating out. Sugar and corn syrup are another common addition that doesn’t belong in good peanut butter. Your gourmet grocer should have a machine that allows you to grind fresh peanuts into peanut butter. If not, look for a jar of “old fashioned” peanut butter, and be prepared to stir the separated peanut oil back into solution. I’m partial to the “crunchy” variety that has bit of unground peanut in it; it adds a pleasant texture that complements the soft sponginess of fresh bread. Feel free to experiment with almond and other nut butters. Though grape jelly is the traditional choice, PBJ enthusiasts love to use a variety of gourmet jams and preserves. The sweetness of the jelly complements the flavors and textures of the bread and peanut butter, while the chunks of fruit or berry add another element of texture and flavor. If you’re health conscious, use unsweetened preserves made from pure fruit. If you’re a serious PBJ gourmet, boil down your own fresh fruit. It takes time, but the results are worth it. The topic paragraph mentioned three ingredients. The 3 paragraphs that follow each explain one of those ingredients. The paragraphs each start with a topic sentence that explains its purpose. Each one discusses only what it says it will. The bread paragraph doesn’t talk about jelly. The jelly paragraph doesn’t explain peanut butter (even though it mentions jelly’s relationship to it). Each paragraph supports one assertion or point. Then, at the end, a closing paragraph ties it all together. In this example, I actually close by repeating the title. The next time you’re hungry and feel like having a peanut butter and jelly sandwich, be prepared by keeping quality ingredients in your kitchen. Fresh bread is always a joy to have around, good jelly or fruit preserves last a long time if kept refrigerated, and even if it takes a few extra minutes to stir peanut butter that’s separated, the taste is superior. Learn the art of the peanut butter and jelly sandwich and this simple lunch will never be boring again. My closing paragraph repeats the topic and purpose of the essay, and it explains the value of the information. The paragraph offers the reader ways to apply and benefit from the knowledge provided. Topic: An essay has 3 major components: A topic paragraph, supporting paragraphs, and a conclusion. Most essays, especially academic ones will need more detail and more supporting paragraphs. Fill in the outline details before writing an essay (or a Master’s thesis) to keep your writing focused. Each layer of your outline becomes a single paragraph that makes a single point. For example, you could expand on the bread paragraph by discussing how flour is ground, or by discussing how various types of grain impart differences in flavor and texture to bread. Maybe you like bread made from almond flour? Write about the relationship between gluten and texture. Maybe you want to explain the bleaching process that produces white flour and any related health consequences? Instead of one paragraph, you could write dozens of them, each discussing a particular ingredient or baking technique. A scholar would follow the bread-making process from the wheat field to the oven. If you understand your topic and the arguments you want to make in support of it, essay writing techniques will make the writing easy. You never need to worry about what to say next. Set it all up in the opening paragraph and the rest will flow. Whether you’re writing a business book or a novel, the simple 5-paragraph essay provides an ideal starting point for understanding and mapping out the road you want to take your reader down. Though “letting it flow” and writing without an outline is part of a natural, intuitive, creative process, an understanding of essay structure will help you focus the results of free writing into an easy-to-understand and compelling narrative. Balance is key. Astute readers will notice that this article does not adhere strictly to the example outline, but it does use focused paragraphs to make its points. Whether you use essay structure as a framework upon which you build a story, or impose it after the fact, the ability to see almost any kind of writing as a chain of assertions and supporting arguments empowers you to create better flow from chapter to chapter, ensure that each chapter and each paragraph has a focused and functional role to accomplish, gauge the relevance of each sentence in each paragraph, and trim “tangent fat” that confuses and distracts readers. An essay is much like peanut butter and jelly and bread—good supporting material sandwiched between an enticing topic paragraph and a nutritious conclusion. What could be more satisfying? There you go being brilliant and creative again! May WGB reach the heights of attainment and be successful as well! Thanks, John. Great to hear from you, and thanks for the kind words.